President Donald Trump shakes hands with White House Physician Rear Admiral Dr. Ronny Jackson, following his annual physical at Walter Reed National Military Medical Center in Bethesda, Maryland, Jan. 12, 2018. President Donald Trump underwent his second physical since taking office on Friday, after last year's checkup raised questions about the true state of his health. Trump, 72, was the oldest president elected in U.S. history at 70. Last year, he was said to be in "excellent health" after undergoing his first presidential physical, according to then-White House doctor Rear Adm. Ronny Jackson, who sparked controversy after a glowing assessment created skepticism among reporters. White House press secretary Sarah Sanders told ABC News this year's physical will once again take place at Walter Reed National Military Medical Center in suburban Maryland. A different doctor, Dr. Sean Conley, the current chief White House physician, will conduct the exam. Ahead of the president's 2018 physical, questions were raised about Trump's cognitive abilities after reports he sometimes repeated himself during meetings. Jackson pushed back on any criticism in a nearly hour-long briefing with White House reporters. Physician to U.S. President Donald Trump Dr. Ronny Jackson speaks during the daily White House press briefing at the James Brady Press Briefing Room of the White House Jan. 16, 2018 in Washington. "There's no indication that he has any kind of cognitive issues," Jackson said. "On a day-to-day basis, it has been my experience the president is very sharp -- very articulate when he speaks to me." Jackson praised the president for having good genes and said Trump scored a perfect 30 out of 30 on the Montreal Cognitive Assessment aimed at detecting mild cognitive impairment and Alzheimer's disease. "Some people have just great genes," Jackson said. "I told the president that if he had a healthier diet over the last 20 years, he might live to be 200 years old. I don't know." 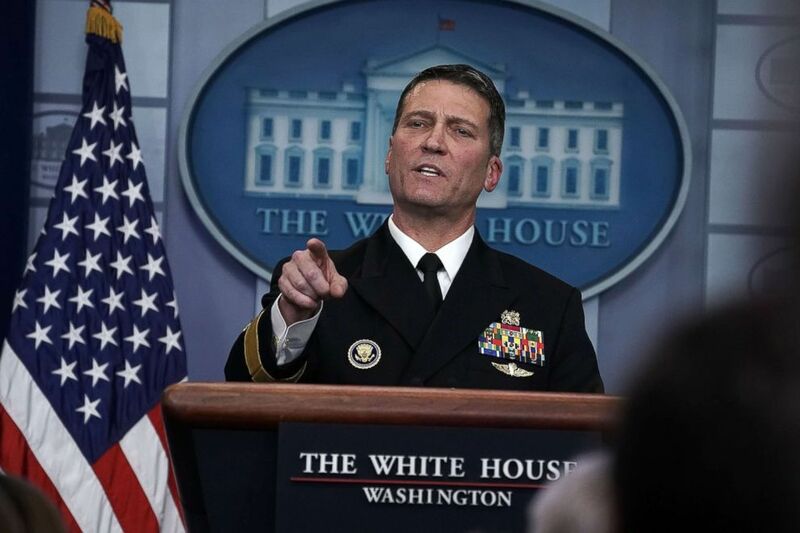 Trump subsequently nominated Jackson to become Secretary of Veterans Affairs, but the doctor was forced to withdraw after allegations of misconduct that still are being investigated. Last year, the outcome of the president's exam noted his 75-inch height, 239-pound weight, total cholesterol of 223 and resting heart rate of 68 beats per minute. Jackson suggested a reasonable goal for the president would be to lose 10 to 15 pounds, adding that a nutritionist would work with the president on his eating habits, especially curbing his appetite for fast food.